The following Round Table Discussions will take place on Thursday, April 6, 2017, at the Holiday Inn in Kitchener. There are two sessions: 12:30–12:45 p.m. and 12:50-1:35 p.m.
A recent study concluded that there is “strong evidence that women faculty perform more service than male faculty in academia, and that the service differential is driven particularly by participation in internal rather than external service” (Guarino and Borden, 2016). This roundtable will provide a venue to discuss this gendered imbalance in service and to explore ways to combat a status quo which places undue service demands on female faculty members. We invite discussion of representations of non-elites in classical literature. From the silencing of Thersites in Homer’s Iliad Book Two to Catullus’ public disparagement of the napkin thief, classical literature is rich in examples of socially marginal characters worthy of further serious analysis. We are especially interested in discussing innovative, interdisciplinary ways of approaching these characters from different theoretical perspectives. We hope you will come prepared to reflect upon not only elitism in classical literature but also potential biases in our own field. Post-docs are emerging as a more frequent option for new PhDs. Should we encourage them? Fundraise to establish more? Can they work well at 4-year colleges as well as at research universities? Are they a helpful career boost, or a more genteel form of adjuncting? This roundtable offers a discussion for young scholars and graduate students who would like to submit a journal article but often feel lost. I will offer my perspective as editor, the DOs and DON'Ts, and I will facilitate discussion answering questions and receiving feedback. We hope to continue the conversation from last year by welcoming anyone who teaches in one- or two-person classics programs (and grad students and allies) to share experiences, ideas and support. This year, let’s look at outreach and connections: how do you maintain a visible presence on your campus? How do you build allies in other departments? How do you convince students to consider classics as a second major or minor? How do you establish connections with the community beyond your campus? This round table will serve to introduce prospective members of the GSIC to the inner workings of the Graduate Student Issues Committee. This round table will also act as a planning meeting for the new GSIC for the upcoming year. Do you have an idea for a classroom activity or outreach event but are not quite sure how to write it up so that you can apply for funding? Please come with your questions and we will turn your ideas into a solid plan. CAMWSCorps, an oral history project modeled after NPR’s StoryCorps, is now in its fifth year of recording (as mp3 audio files) conversations with veteran CAMWS members. Each half-hour interview is conducted by a Classics graduate or undergraduate student. To date, 62 interviews have been recorded; all are stored in an online archive, accessible by request to researchers and others interested in the history of Classical Studies in North America. At the round table we will reflect on what CAMWSCorps has accomplished so far and brainstorm about what else it might attempt in the years ahead. Since the turn of the century, there has been a growing number of opportunities for students to not only engage in research at their home institution but to also participate as part of the academic discourse by presenting papers at conferences. We welcome undergraduate students as well as their mentoring faculty to join us to share their research interests, processes, and experiences with other undergraduates. As young members of the Classical community, it is extremely valuable to gather together and share our experiences with one another. Per a recent SCS survey, the number of minority students in Classics is disturbingly small. This is partly due to our research and classroom emphases on white, able-bodied issues. To encourage more diversity in the field, we must endeavor to reach out to minority students, as well as encourage research into marginalized identities in the past. These research foci must be incorporated into our broader understanding of the ancient world so that they are not sequestered into separate units but are integrated throughout discussions of art, politics, the economy, warfare, and so on. 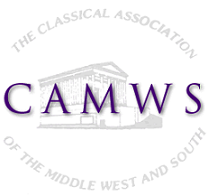 This session will focus on the CAMWS Latin Translation Contest, an annual competition open to both intermediate and advanced students at both the high school and college levels. This discussion will focus on the changes implemented to the contest over the past two years and will consider opportunities for future improvement. This is open to contest committee members, teachers whose students participate in the contest, and anyone else who is interested. This roundtable offers updates and open discussion of the current state and future of testing and assessing ancient Greek, including the National Greek Exam, the College Greek Exam, and more broadly assessing Greek with digital tools. All those interested in these topics or wishing to be involved with them are encouraged to come. We will discuss the activities of the National Latin Exam, not only the exams themselves, but also the awards available for students and teachers, and the support materials that the NLE produces. We will answer questions from participants. Through the Paideia Institute’s Aequora program, graduate, undergraduate, and high school students to offer introductory Latin classes for elementary and middle school students that reinforce English and Spanish literacy skills. We will discuss Aequora as a model for community engagement through Classics and use Aequora as a starting-point for an exploration of the goals and potential of Classics outreach and the challenge of expanding access to Classics in a way that is both conscious of and disruptive of elitist and/or imperialistic models of classical education.